The Fallow Deer (Dama dama) is a ruminant mammal belonging to the family Cervidae. 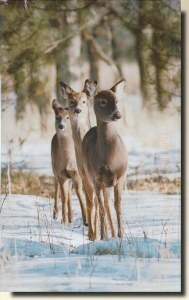 The male is a buck, the female is a doe, and the young a fawn. Bucks are 140-160 cm long and 90-100 cm shoulder height, and 60-85 kg in weight; does are 130-150 cm long and 75-85 cm shoulder height, and 30-50 kg in weight. 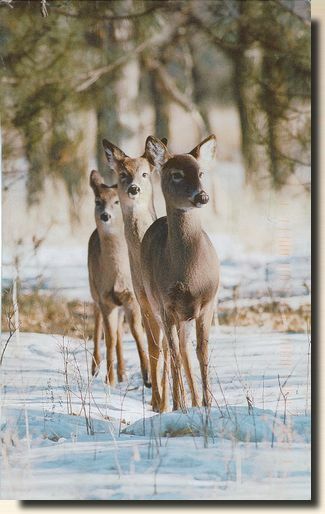 Fawns are born in spring at about 30 cm and weigh around 4.5 kg. The life span is around 12-16 years. All of the Fallow deer have white spots on their backs, and black tips at the ends of their tails.